Wesley Heights offers adults ages 62 and over the opportunity to live safely and securely within a caring community, knowing assistance is always nearby. Wesley Heights offers independent and assisted living on the Wesley Village Senior Living Campus. Download our brochure to learn more about all Wesley Heights has to offer! 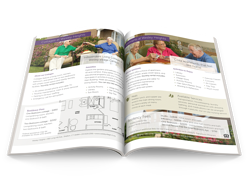 In our brochure you'll find information on our amenities and personalized caregiving options. For more information on our Wellness Center, click here. For more information on our Lifestyle Transitions Enhanced Assisted Living and Memory Support neighborhood, click here.